A graduate student assistantship (M.S. or Ph.D.) is available in the laboratory of Dr. Eric Collins at the University of Alaska Fairbanks (http://www.reric.org). Contact Dr. Collins (student-app@reric.org) to discuss the position in more detail. Please include a brief description of your research interests, experience, and academic preparations. Competitive applicants will have a strong academic background in the natural sciences, prior field or research experience, and an interest in microbial ecology and evolution. Applications should be made to the graduate program in the School of Fisheries and Ocean Sciences (http://www.sfos.uaf.edu/prospective/graduate), applications will be reviewed on an ongoing basis. Funding is available for an M.S. 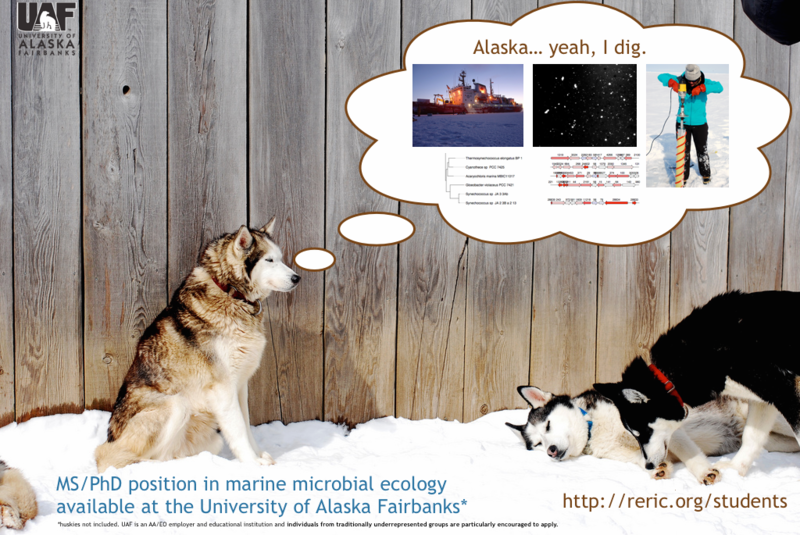 or Ph.D. student to develop a thesis project investigating the diversity, distribution, and evolution of polar marine microorganisms. The student will engage with a team of researchers at the University of Alaska on the broader question of how biophysical processes (e.g. 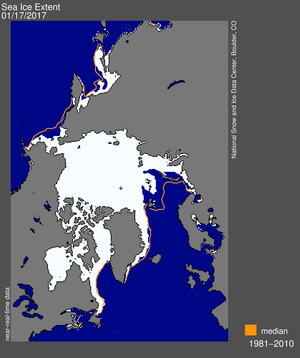 sea ice, primary production) influence the entry and fate of elements, greenhouse gases and contaminants in Arctic marine ecosystems. This is an inter-disciplinary project that includes experts on sea ice, polar oceanography, biogeochemistry, microbial ecology, and genomics. The candidate will have the opportunity to engage with students and faculty across these disciplines. Field work for the project is based primarily in the Alaskan Arctic, with the potential for additional field work conducted on the R/V Sikuliaq (http://www.sfos.uaf.edu/sikuliaq). Prior experience with bioinformatics or computer programming is highly desirable. Please see the following websites for more information about UAF (http://www.uaf.edu), the Institute of Marine Sciences (http://www.ims.uaf.edu), the UAF Graduate School (http://www.uaf.edu/gradsch), and Dr. Collins’ research (http://www.sfos.uaf.edu/people/profile.php?uid=3198). The University of Alaska Fairbanks is accredited by the Northwest Commission on Colleges and Universities. UAF is an affirmative action/equal opportunity employer and educational institution. Members of traditionally under-represented groups are especially encouraged to apply.